CAIRO Egyptian President Mohammed Morsi faced the prospect of widening civil disobedience on Monday as media and the tourism industry pondered measures to join a protest by judges against the Islamist leader. The country's judges have already gone on strike over Morsi's Nov. 22 decrees that placed him above judicial oversight. Following those decrees, a panel dominated by the president's Islamist supporters rushed through a new draft constitution without participation of representatives of liberals, the Christian minority or women. Morsi then called a national referendum on Dec. 15 to approve the new constitution. An opposition coalition dominated by the liberal and leftist groups that led last year's uprising had already called for a general strike on Tuesday and a large demonstration against the constitutional process and Morsi's decree. 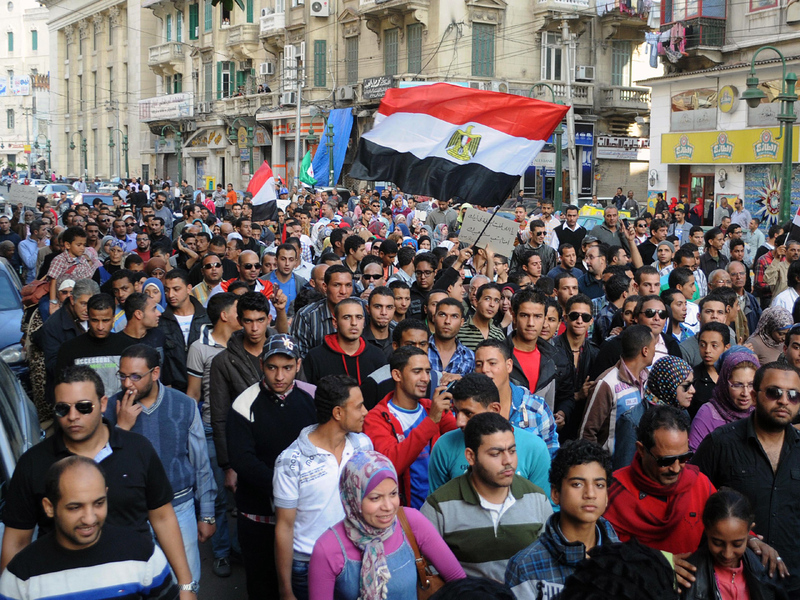 They plan to march on the presidential palace in the capital Cairo. Newspapers plan to suspend publication on Tuesday while privately owned TV networks will go dark all day. The full front pages of Egypt's most prominent newspapers on Monday said: "No to dictatorship" on a black background with a picture of a man wrapped in newspaper and with his feet cuffed. Hotels and restaurants are considering switching off their lights for half an hour on Tuesday to protest against Morsi, according to the Supporting Tourism Coalition an independent body representing tourism industry employees. Morsi's moves have plunged an already polarized Egypt in the worst political crises since the uprising nearly two years ago that ousted authoritarian President Hosni Mubarak. The crisis left the country divided between Morsi and his Islamic fundamentalist Muslim Brotherhood along with another ultraconservative Islamist group, the Salafis, in one camp and their opposition in the other  youth groups, liberal parties and large sectors of the public. The opposition brought out at least 200,000 protesters to Cairo's Tahrir Square on Tuesday and a comparable number Friday to demand that Morsi's decrees be rescinded. For ten days, protesters have camped out in the square and planned for a massive rally at the presidential palace on Tuesday. The Islamists responded Saturday with hundreds of thousands of protesters in Cairo's twin city of Giza. Thousands took to the streets and imposed a siege on Egypt's highest court, the Supreme Constitutional Court. The court had been widely expected to hand down a ruling on Sunday that would declare the constitutional assembly that passed the draft charter illegitimate and disband parliament's upper house, the Shura Council. But instead, the judges went on strike after they found their building under siege by protesters. Three of Morsi's aides have also resigned over his decree. Two members of the official National Council of Human Rights quit on Monday, describing the decrees as "disastrous." They expressed "real fears" of Brotherhood hegemony in Egypt. The new draft constitution has been criticized for not providing protection for women's and minority rights. Critics say it empowers Islamic religious clerics by giving them a say over legislation while some articles were seen as tailored to get rid of Islamists' enemies. The draft has a new article that seeks to define what the "principles" of Islamic law are by pointing to theological doctrines and their rules. Another new article states that Egypt's most respected Islamic institution, Al-Azhar, must be consulted on any matters related to Shariah law, a measure critics fear could lead to oversight of legislation by clerics. Rights groups have pointed out that virtually the only references to women relate to the home and family, that the new charter uses overly broad language with respect to the state protecting "ethics and morals" and fails to outlaw gender discrimination. Judges are on strike across the country and the powerful judges' union said Sunday that they would not oversee the referendum, as is customary. However, the country's highest judicial body, the Supreme Judiciary Council, agreed on Monday to oversee the voting in a step legal experts described as "routine" and not obligatory. And the electoral commission, led by senior judges, was forced by law to hold a meeting on Sunday to discuss preparations for the referendum. Morsi's legal advisor Mohammed Gaballah said the election commission began meeting on Sunday to organize the referendum. The official Al-Akhbar daily ran a front page picture of the senior judges at the meeting and Gaballah claimed that the judges will oversee the vote. But Judge Yousseri Abdel-Karim, a former spokesman of the electoral commission said that the commission's mission is administrative and the meeting does not mean that judges are going to oversee the referendum. "Judges don't retreat and we fear nothing and we will not change our position," he said. Opposition figures have said they fear referendums because in past votes, large numbers of voters, many of them illiterate, were easily swayed by Islamists who used religious sentiment for influence. Voting for Egyptians abroad is set to start on Saturday. Expatriate Egyptian activists and groups in Britain called Morsi's decree a blatant assault against the rule of law.